500% Radiation Increase from Red-Painted Disposable Eating Utensils? Seriously? 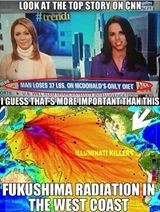 After independent reports of radiation levels skyrocketing on the beach in California and doubling from snowfall, officials reproduced the results but dismissed any link to Fukushima and suggested “red-painted disposable eating utensils” were the likely cause. Seriously?